Both Box and Dropbox are cloud-based content management and file sharing systems specially designed for businesses and enterprises to securely store their documents and files in one central place so that they can share them from anywhere at any time they want. Although they belong to different companies, they have similar offerings: cloud-based storage, seamless syncing across devices, and secure sharing. They have a lot in common, of course, but Dropbox is all about managing files in the cloud mostly for individuals, whereas Box is more enterprise-focused mainly targeted towards businesses. Both the companies have some noteworthy differences, but the key difference lies in the way you access your files. 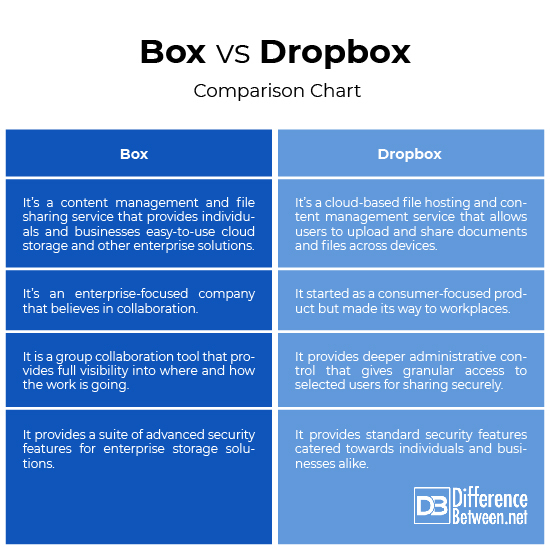 We present an unbiased comparison between Box and Dropbox to immediately evaluate their differences. Box is a cloud-based file storage and file sharing service that provides individuals and business easy-to-use cloud storage solutions and collaboration tools. 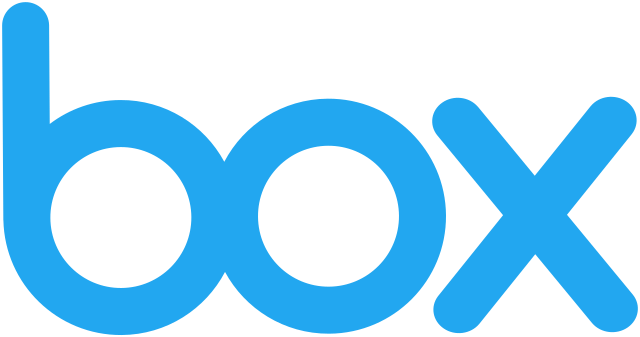 Originally developed by Aaron Levie in 2004 as a college product and officially launched in 2005, Box thrives to become an enterprise-focused product with over 37 million users worldwide. Box held its IPO on the NYSE in the early 2015 and enjoyed a significant growth since then. Founded by Drew Houston and Arash Ferdowsi in 2007, Dropbox is a content management and file sharing service that thrives to create a collaborative workspace that brings all your files and documents in one central place. It allows users to upload videos, documents, and other content for backup storage. Anything you add on Dropbox will automatically synchronize with your Dropbox account allowing you to access your content from multiple devices from anywhere you want. Box is a cloud storage company based out of Redwood City, California. It’s a content management and file sharing service that provides individuals and businesses easy-to-use cloud storage and other enterprise solutions. Box is popular among large enterprises and the company places a strong emphasis on security. Headquartered in San Francisco, California, Dropbox is the ultimate cloud storage tool for individuals and businesses alike which established itself as one of the largest file-sharing platforms in the world over the years. It allows users to upload and share videos, photos, documents, and other content from anywhere and at any time. Dropbox offers the Basic plan that comes with 2 GB of free space and if you want additional space or features, you can switch to Plus, Professional, or Business plans. Dropbox Plus offers 1 TB of space priced at $9.99 per month ($99.00 annually) and Professional offers 2 TB of space priced at $19.99 a month ($199.00 annually). Dropbox Business offers three plans to fit your team’s needs: Standard, Advanced, and Enterprise. Standard offers 3 TB of storage space priced at $12.50 per user per month, with a minimum of three users; Advanced provides unlimited storage for businesses priced at $20 per user per month, starting at three users; and the Enterprise plan is built specifically for large businesses that need customized solutions with individual customer support. Box, on the other hand, offers plans for both individual users and businesses. Box offers a free Individual plan that comes with 10 GB of storage and file upload limit of 250 MB. If you want more space, you can switch to the Personal Pro plan that offers 100 GB of storage with 5 GB file upload limit priced at $10 per month. Box offers three business tier plans: Starter plan for small sized teams priced at $5 per user per month starting at three users up to 10 users with 100 GB storage and 5 GB upload limit; Business plan offers unlimited storage with 5 GB upload limit of files priced at $15 per user month; and the Enterprise plan offers enhanced security features with unlimited storage and 5 GB upload limit, starting at three users with no limit on number of users. Box puts a strong emphasis on collaboration and security with total transparency and control over the content. Box makes it easy for the owner to oversee the workflow by providing secured access to files across different devices. It is a group collaboration tool that provides full visibility into where and how the work is going. Additionally, it provides external access for users outside of Box regardless of the device they’re using. Dropbox syncs data securely across devices so that users can access them from anywhere they want. It gives granular access to selected users for sharing securely. Dropbox provides multiple layers of protection that is distributed across its secure infrastructure to protect users’ accounts. Dropbox provides advanced encryption to safeguard your files and confidential documents using 256-bit AES. In addition, it can wipe data remotely in case your account is compromised or device is lost. Box provides a suite of advanced security features including two-factor authentication, data encryption, shared link password security, document watermarking, admin role delegation, bulk managed user provisioning, password policy enforcement, enterprise mobility management, granular permissions, and more. Both the companies basically serve the same purpose, cloud storage solutions and seamless syncing across multiple devices, but they have noteworthy differences that make them stand out. Dropbox is more of a consumer-focused product, at least it was but over the years, became one of the world’s largest file-sharing platforms with over 500 million users worldwide. Box is an enterprise-focused company that helps individuals and businesses use cloud-based computing to meet their current and file-sharing and file storage needs. Both offer individual plans and multiple business plans to cater to both individuals’ and enterprises’ needs. Sagar Khillar. "Difference Between Box and Dropbox." DifferenceBetween.net. August 9, 2018 < http://www.differencebetween.net/technology/difference-between-box-and-dropbox/ >.